Students now have more incentive to take rigorous science, technology, pre-engineering, and math classes at Middle Georgia State University (MGA). In fall 2017, students began receiving a boost to their college HOPE GPA for specific, rigorous STEM courses typically offered during the first two years of college. 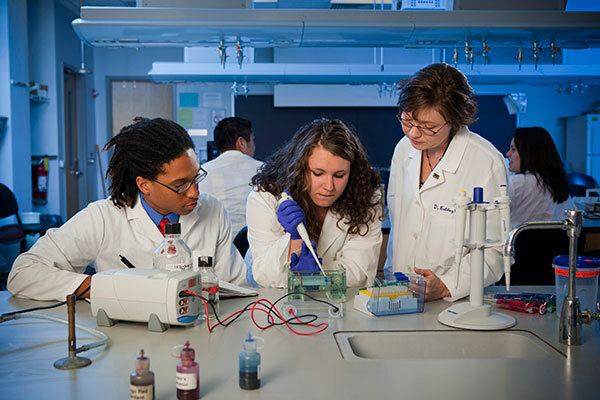 Each HOPE-eligible college in Georgia will add 0.5 to the postsecondary HOPE GPA calculation in specific, approved STEM courses if the grade is a B, C or D.
"This is great news for students thinking about STEM majors," said Dr. Mary Wearn, MGA's assistant provost for Academic Planning & Policy. "They can take on these more rigorous courses with less worry about retaining HOPE." Georgia House Bill 801, designed to give students incentive to choose a science, technology, engineering and math (STEM) field of study, was passed during the 2016 legislative session. After signing HB 801 into law, Gov. Nathan Deal appointed the HB 801 Task Force to determine which courses meet the requirements to receive this new postsecondary HOPE GPA boost. “I am confident this new initiative will encourage more Georgia students to enroll in STEM classes that will lead to career fields where we have jobs waiting for them,” Deal said. The courses currently approved are ones required to obtain a major leading to one or more of the STEM career fields that require at least a bachelor’s degree and are considered to be in high demand in Georgia. For more information and to see what courses are eligible, see https://www.gafutures.org/hope-state-aid-programs/hope-zell-miller-scholarships/hope-scholarship/stem-weighted-course-directory/.